We had a cooler, wetter springtime this year than we have had in a while and the cauliflower was loving it! I recently moved in to a new place and things got really busy between that and my summer volunteer gigs. I also happened to have a pretty bad arthritis flare right after moving that has made things difficult. I have just had so much to do lately and only a few 'good' (low-pain) hours a day to actually be productive that I haven't really been online much. I got some steroid injections earlier this week though and I think things are turning around. I also think we are finally settled in at the new place which means I should have a bit more time! I should be back in full force in no time. I really appreciate you checking up on me though. It means a lot, man. Thanks. It got a lot of sun the past few days and was just starting to turn purple. I didn't have it blanched. I meant to harvest it last week but have been busy moving into the new place. 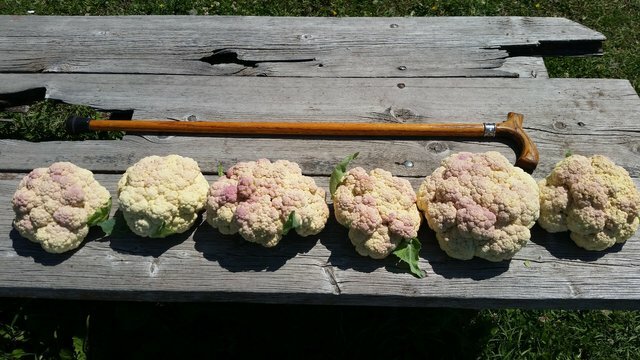 You ever grow cauliflower, @amberyooper? I grew it a long time ago, I haven't grown it in more than 20 years.